Combining personal experiences with cultural critique, blending historical analysis with a coming-of-age memoir, this collection of chapters reveals a scholar’s eye for nuance and an essayist’s knack for insight. This eclectic book examines holidays, both religious and secular, from a perspective of an “anti-theist.” Adopting Christopher Hitchens’ term, John G. Rodwan claims allegiance to not merely denying supernatural belief passively but actively confronting its suppositions. He thoughtfully critiques a less examined aspect of embedded, mandated, and communal commemorations within American life. Race, ethnicity, occupation, territory, class, school, sectarianism, team, music, patriotism, and parades, after all, characterize many public rituals as well as denominational celebrations. Within a short space, Mr. Rodwan roams widely. He begins with a preface praising, from his French visit, the joy of uncorking the first Beaujolais nouveau of the season as the type of personal routine he fervently supports. He can imbibe a holiday spirit without being a Scrooge, he assures us, and he carries on with conviviality and cheer. His book confronts the complacencies of observance by contrasting the stories which, in his life or that of those more famous, express freethinking challenges. Instead of following patriotic tradition, social convention, or religious ritual for its own sake, Mr. Rodwan champions choice. Martin Luther King Day, belief as expressed in popular music, Salman Rushdie’s fatwa declared on Valentine’s Day, and doubts expressed by a Jesuit priest at his high school and within the literature he had assigned comprise the first essays. Listing these topics conveys their thematic range. During a nimble romp around literary expressions of unbelief, after navigating the many inconsistencies within the Gospels themselves, he nods to Easter’s symbols, appropriated from pagan fertility practices. Contrasting the Christian claims of triumph over mortality through a resurrected body and soul with those of hope for rebirth and renewal grounded in the cycle of life rather than a liturgical round, Mr. Rodwan surmises chocolate eggs may symbolize a truer lesson for our offspring. Tearing off the shiny foil, biting into the sweetness, a crumbly shell gives way to nothing inside. “Reproduction via material parents—physical fathers and non-virginal mothers—offers the most genuine hope for victory over death.” This epitomizes his scrutiny of symbols for what they reveal to the careful observer, and his rejection of “narrative ways” by which believers “evade their fears.” The Bible survives, he surmises, in part from its being passed on by so many faithful, uncritical believers, for devoted generations on end. Returning to a theme in his earlier essay collection, Mr. Rodwan shifts into an examination of the confidence-man. He uses a few passages gleaned from Herman Melville’s fiction (if much too rapidly given the depth of such intricate sources) to touch on conflicts between faith and charity. He then segues (each of 15 main chapters gets an interlude) into the tenuous connections often asserted that boxing matches of a particular era embody that time’s mores. The connections with holidays or disasters grow maybe too subtle, but sports continues with baseball season’s opening day as a ritual many flock to fulfill, as played off against Mr. Rodwan’s boredom with that national pastime. Still, as when he juxtaposes a scene not from the opening chapter of Don DeLillo’s Underworld (set at the New York Giants’ Polo Grounds), but Mao II (set at Yankee Stadium), where Moonies by the thousands enter into a arranged mass wedding, to show the allegiance of fans to players procured by calculating owners as leaders, Mr. Rodwan’s literary and cultural connections display wit and verve. As a native of Detroit, Mr. Rodwan’s continued concern with race and class continues with a survey of the Overground Railroad, the Great Migration of blacks from the South to the North’s factories in the past century. Jack Johnson’s boxing defeat of The Great White Hope, Jim Jeffries, attests to another kind of commemoration, the realization that Independence Day and that match’s win on that day both inched equality closer to the reach of more of America’s millions than before the Emancipation Proclamation. Other clashes--between European immigrants, nativist workers, bosses, and hired thugs--peppered Labor Day’s rise and fall as a marker of rights claimed for those in factories and on farms. With one-hundred-and-ten numbered boxes, Mr. Rodwan tallies his possessions as he and his wife move from New York City, as it happens exactly eight years after 9/11. He considers the “coarsening and dulling effect over time” which that city exacts from its residents. Despite the cultural enrichment and the culinary delights, he reasons that relocation was always an option in his peripatetic career. He looks at the memorial services, political cant, and spiritual humbug around 9/11. His apt perch as a resident but not a native, enhanced by his skepticism about platitudes and parades, provides us with an appropriate platform to study the reactions to Patriot Day, shutting out the sound bites and slogans. He moves all around the country, too. Detroit’s infamous Devil’s Night and other Halloweens, Evacuation Day as a now-forgotten party to cheer the rout of the British in 1783 from New York City, Thanksgiving, and finally, inevitably, Christmas occupy the remaining holiday-centered considerations. He cautions against those who, in the name of Yuletide cheer, spread and keep viable as a sacred Christmas that which they as secular enablers sustain, against their own atheistic values and actions. He shares advice about the wisdom of whether to join in at other people’s fervently celebrated holy days. Beauty, Mr. Rodwan avers, needs no belief system to affirm it. Wonder and awe exist free of a deity or a supernatural presence. Love needs no commandment. “Submission to an invented higher power can discourage rather than promote curiosity.” Contemplation and reflection may thrive separated from an obligation towards fealty to a higher power. As with the arrival of another year’s fresh Beaujolais, vital traditions may thrive. People may convene, unbidden by Scriptural imperatives. Appending a wish list of those he’d like to see remembered and how particular dates embedded in our national or sacred calendar might be reconsidered in a secular response, Mr. Rodwan concludes with a reiteration of the need for freedom to be extended beyond the often unacknowledged or unchallenged religious affirmations so much a part of public discourse. After all, “freedom from compulsion” remains an expression of liberty afforded to those of no higher belief as well as to all sorts of believers. His excursion might meander, across the nation and its history as well as in his lifelong struggles against God. 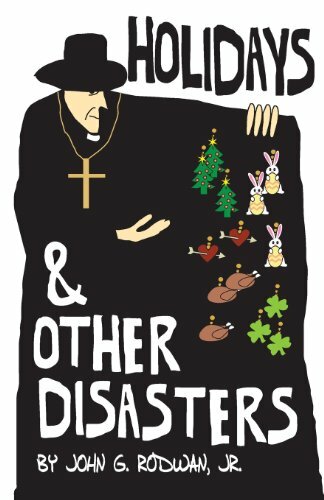 Yet Holidays and Other Disasters, as its title promises, delivers a wry, sharp look at ritual and routine.